On to day two then and straight to the second stage, as a rather poor showing welcomes Battalions to open the day. There are grooves are a plenty, rough vocals pointing at their sludgier end and the 60 or so that have gotten up/over their hangovers seem to enjoy them, judging by the headbanging a plenty, while the crowd did slowly pick up as the set progressed. A good set by a band continually going from strength to strength. Absolva open Stage One, and the room is decently busy. There’s a fair amount more melody than the second stage, as would be expected from a band that model themselves on Iron Maiden and Metallica for the formation of their sound. They clearly go down well with the crowd, interact with them well and perform to a high standard. The bar has been set for the first stage today at a good level. Desert Storm are next up for the second stage and the crowd has definitely grown for a band that has won hearts and minds at previous HRH events. The riffs are monstrous and the sound huge, with more nodding heads than a Churchill dog factory showing quite how well they’re appreciated. They somehow keep outdoing themselves with their live shows, which is a testament to their inability to settle for anything. Great set. Boss Keloid are the next band I catch, still on Stage Two and a very busy room awaits me as I enter just after the start of their set, with an almost crowd wide rhythmic nodding a show of the hypnotism they are weaving amongst the watchers. Their melodic yet discordant grooves are a joy to take in, with some quite obvious prog influences being equally jarring and enjoyable as they work through their set. One of the bands of the weekend. Fire Red Empress have one of the hardest clashes of the Stage One bands across the weekend and it shows as the room is maybe a third full. The band give it their all, undeterred, sounding pretty damn good, with gravelly vocals adeptly supported by doom riddled backing music proving to be a very good combination. There are clear indications from the crowd that they’re enjoying the band, which I can fully appreciate myself – just a pity they clashed with Boss Keloid. Following straight on, Pythia take the mid-bill slot on Stage One, to a fairly empty room, spurred by the second stage starting slightly earlier and a refuelling before the rest of the evening’s debauchery. The band are likeable enough, but sadly vocalist Sophie’s vocals just do not come across as strong enough. There’s no doubting she has talent, but there seems to be a lack of power from her, be that naturally or in the mix at the desk, something just doesn’t come across as quite right, evidenced by people starting to drift out within the first couple of songs. A pity, as it’s otherwise quite enjoyable power metal. Stage Two moves from its stoner phase into straight out doom now, with Ten Ton Slug playing to a very busy room. Tribalistic drum beats are hammered out over some slow, heavy riffs, led by some growled our vocals, performed as if by some demon from hell bellowing curses at passers-by. 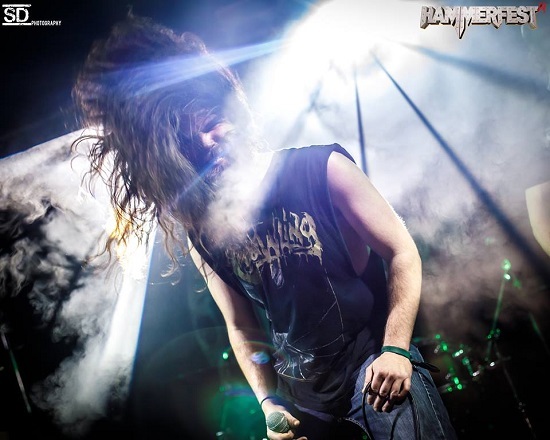 The plethora of movement, from nodding to heads to moving bodies and stamping feet, show the crowd enjoy their set, with it being an excellent introduction to the doom end of the entertainment. A break sees me return in time to take in Cellar Darling on the first stage with the room having picked up somewhat from where it was when I earlier left it. The blend of Folk and Prog is strong in the set, with the audience reaction getting better as they wind through the set. 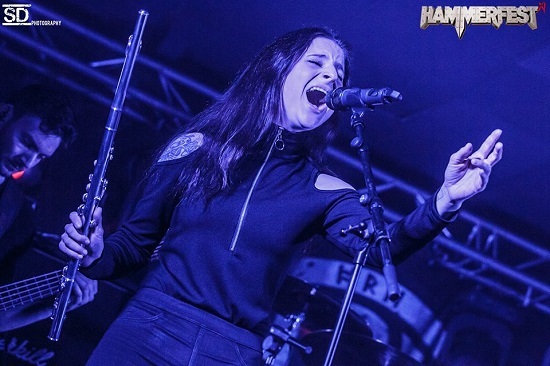 Anna’s haunting vocals, alongside her talented hurdy gurdy and flute playing make for an understated but accomplished frontwoman, while Ivo and Merlin provide more than capable musical backing on the guitar and drums respectively for Anna’s talents. Meanwhile, Arkham Witch are darkening Stage Two, with the second stage being almost as full as when Ten Ton Slug were ripping it apart earlier. 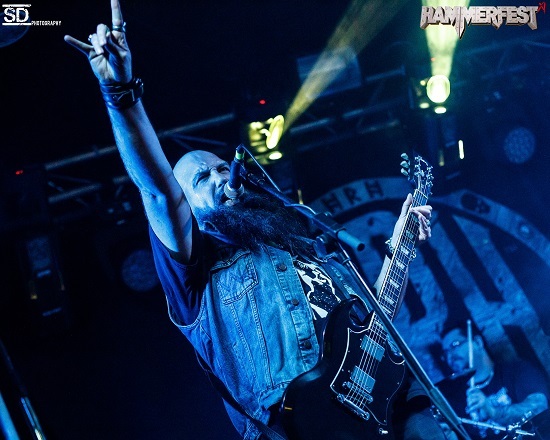 The sound is a lot closer to the old school rock and metal legends, with a NWOBHM bent to the music, alongside a vocal set in the style of low end Cirith Ungol. The audience are interested and enjoying the set, showing the band’s quality in entertaining people and their ability to win over newcomers. A powerful set. Master Charger take the reins from Arkham Witch, with the room disappointingly quiet, vacated for the other arena, though people do start creeping slowly back in as the music kicks in. I’ve seen these guys a few times now and they’ve never disappointed, a trend continued tonight. They always give their all and the fact that the room continually gets busier right through their set is a tribute to the sheer quality of music that these guys are putting out there, ending with a half full room which is many times over what they started with. Never anything but high-quality doom in a vein Sabbath themselves would feel privileged to have written. My night is curtailed at this point as two days of walking round with a slipped disc catch up with me and so I call it quits in order to recharge my batteries for the final day of metal mayhem. 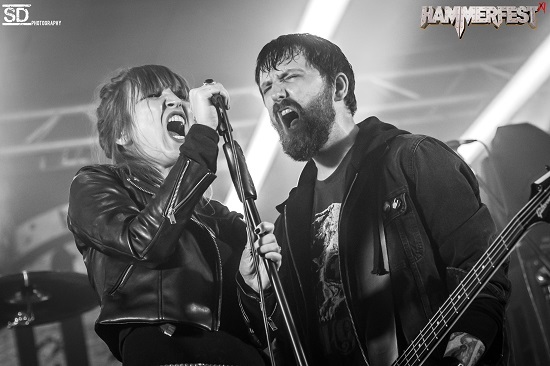 PHOTO CREDIT: All photos courtesy of SD Photography/Hammerfest. Copyright held by the photographer.